In this post we are going to discuss multiplication of two matrices , i.e. when two matrices can be multiplied with each other or when two matrices are NOT eligible for multiplication, what are the necessary conditions for the multiplication of two matrices to be multiplied. If condition for matrix multiplication is satified, then below is the method of multiplication for two matrices . Let's take two matrices A and B of 2 × 3 and 3×2 orders respectively. The resultant matrix will be 2 × 2 matrix. we start across the 1st row of the first matrix multiplying down the 1st column of the second matrix, element by element. Then we add the resulting products. Our product will be written in position a11 (top left) of the answer matrix which will be equal to "au+bw+cy". We shall repeat similar process for the 1st row of the first matrix and the 2nd column of the second matrix. The result will be written in position a12 which will comes out "av+bx+cz". Since Numbers of columns (3) in 1st matrix (Here A Matrix ) is not equal to numbers of Rows (1) in 2nd Matrix (Here Matrix B ). Therefore matrix multiplication is NOT possible in this case. This video can better demonstrate the multiplication of two matrices . And what about the matrix multiplication of AB and BA of the matrices given below whose order are 4×3 and 3×3 respectively . Then Matrix Multiplication BA is not possible as the numbers of columns(3) in matrix B is not equal to the numbers of rows (4) in matrix A . But If we want to Multiply the matrix A with Matrix B as AB then it is possible as the numbers of columns(3) in A matrix is equal to the numbers of rows(3) in B matrix, so it can be calculated as explained earlier. It means the order of the matrices play very important role to decide whether matrix multiplication is possible or not. And if possible it is again the order of both the matrices to decide what will be the order of the resultant matrix. Therefore in multiplication of matrices of 4×3 and 3×3 .The order of resulting matrix will be 4×3 ,The outer most numbers ( Marked red ). 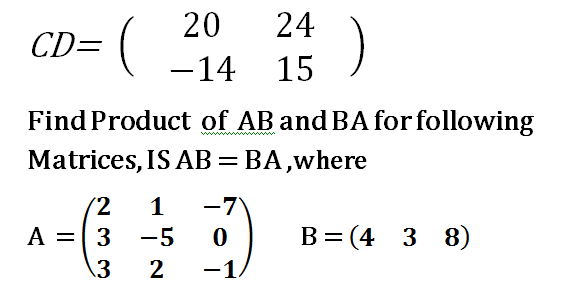 In 1st case where we have to find AB , let us check its multiplication would be possible or not , as number of columns (3) in 1st matrix is equal to numbers of rows (3) in 2nd Matrix , so AB would be possible and order of resulting matrix would be 1×1 and it can be found using matrix multiplication . In 2nd case where we have to find BA , let us check its multiplication would be possible or not , as number of columns (1) in 1st matrix is equal to numbers of rows (1) in 2nd Matrix , so AB would be possible and order of resulting matrix would be 3×3 and it can be found using matrix multiplication . This post was about multiplication of two Matrices, Eligibility conditions for product of matrices, Thanks for giving your valuable time to this post . If you liked this post,Please share your valuable opinions about this post. See you in next post ,till then Bye.